It had been over three years since we went mountain biking in Sedona. 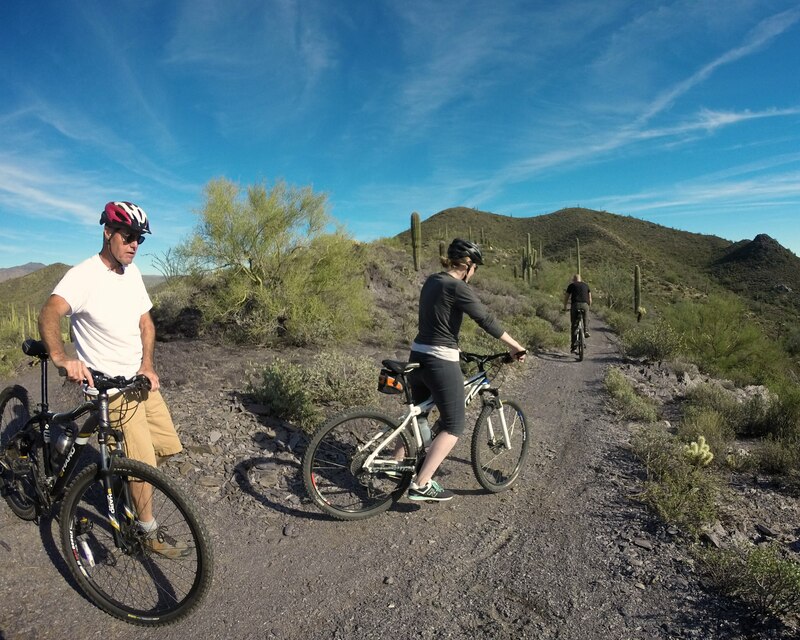 This time when we visited Arizona we explored the trails around Cave Creek. We had a 29er and a 26er hardtail mountain bikes with us. At the Horny Toad bike rental in Cave Creek we got a 29er hardtail for Mimi and I got a Surly Pugsley fat bike with thumb shifters. I liked that the bicycles not only helmets but also had two bottle cages and a saddle bag with a spare tube and tire levers, so that you don't get stranded in case of a flat tire. Something you don't get at every bike rental. This was the first time for me riding a fat bike, apparently not everyone enjoys it, but I quite liked the bicycle. Being used to riding my own bicycle loaded with luggage it took some time to get used to the sound of the chain slapping around on the chainstay and to the fact that I could roll over large obstacles without difficulty. Sometimes the whole trail was obstructed with large rows of rocks. At first they seemed way too big, but during the second half of the trip I was going over them at full speed. I worried that the front chainring might bump into them, but as long as I kept the pedals out of the way there was no problem with clearance. 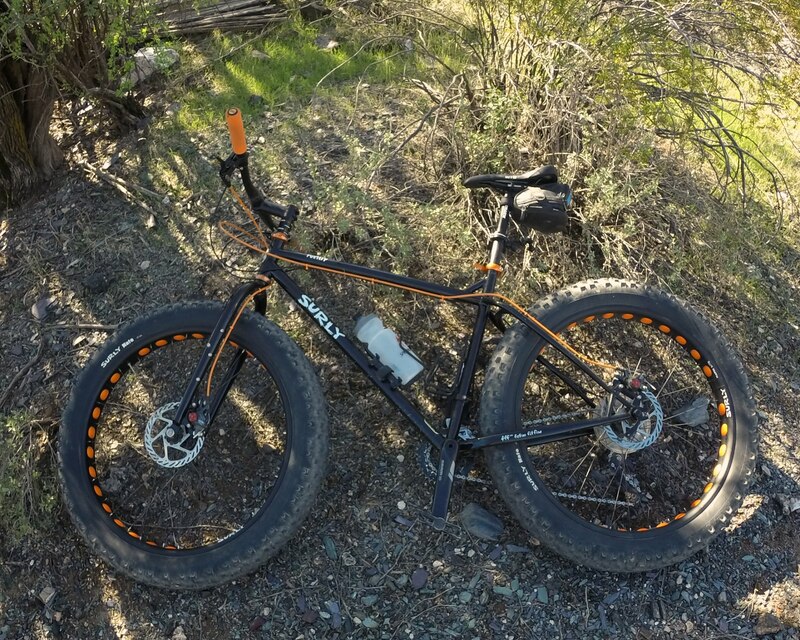 Only after switching to another bicycle did I notice how heavy the fat bike was. 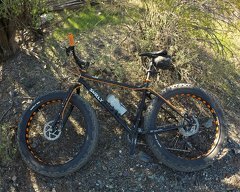 The 29er which normally feels stable and relatively heavy compared to the agile 26er felt light and nimble compared to the fat bike. The others that tried the fat bike quickly wanted to switch back, and so did I, as I had got used to just rolling over every obstacle. The old school thumb shifters worked surprisingly well. The left shifter was set up as a friction shifter (non-indexed) and the right one was indexed. I liked the fact that I could shift multiple gears at once and by feel. On my own bicycle with the internal gear hub I like the trigger shifter a lot, but on other bikes with derailleurs they don't work so well, they feel cheaper, shifting is slower, and there are often issues with adjustment or even worse. The trails are also used by hikers and horses, to which cyclists have to yield, but the trails were pretty quiet. There were no horses, and only near the parking lot there were some hikers for which we slowed down and they stepped aside. We did come across a handful of other mountain bikers coming towards us. One of them on a particularly narrow stretch of single track, where he did not slow down, or move aside. Like pretty much everywhere else in central Arizona, the surroundings were quite harsh. Everything is dry with sharp edges. I got several thorns stuck in my tires, but they just broke off and stayed in as a plug. Trying to figure out where we are. Back on the Slate Trail. Video of 3:24 minutes of cycling on the trails near Cave Creek, available in HD. We took the two bicycles we rented from the bike shop to the trail head, where we parked the car which was carrying the other two bicycles. From the trail we wanted to get on the trails in the Cave Creek Regional Park. However, while on the way there we got sidetracked on another trail. The trail was getting quite difficult, and we had to walk several uphill stretches. After a while I began to notice that we had not seen any signs lately and we stopped to check the map. Our map was a low quality copy with some black lines and symbols that we got from the bicycle rental place, combined with online maps and GPS on our phones we were able to conclude that we were definitely not on the trail. Figuring out where exactly we were took a bit longer. After a while I spotted another biker coming down a ridge, which helped us see where the trail went. We got back on the bicycles and continued towards the regional park's parking lot where there is water. I was especially eager to get there, was I was quickly running out of water. Even though it rained the night before, everything was pretty much bone dry. Last time we went mountain biking in Arizona Mimi was dehydrated. She had learned and had two bottles with her. I only had one, and I drank it well before we reached the parking lot, fortunately this time I was able to get some of Mimi's water. We went left to where we saw the other cyclist and managed to get back on the trail, where it was easier riding. After about two hours we had reached the parking lot, the entrance of the regional park. Since you don't have to feel thirsty to be dehydrated I drank as much water as I could and filled up my bottle. Our energy levels were starting to drop, and we still had to bring the bicycles back, so we decided to head back, this time we stayed on the trail, which was significantly easier, as we did not have to walk, and were also more accustomed to our bicycles. Sometimes the trail was just too rocky for us and the bicycle would come to a stop. 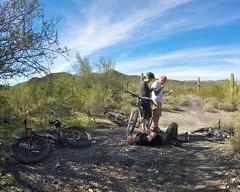 I clipped a pedal against a rock at the start, other got some bruising from a sudden stop, and several of us got cactus needles embedded in our skin. The trails around Cave Creek are good fun, ridiculously bumpy at times, there should be more signs.